Oct 17, 2014 - N.A. A 1962-63 Ferrari 250 GTO Berlinetta, serial number 3851GT, sold at Bonham’s Quail Auction on August 14, 2014 for US $34,650,000.00 ($38,115,000.00 including buyers premium). While collectible cars have been sold privately for more, this is the highest price ever paid for a car at a public auction. The record was previously held by a 1957 Ferrari Testa Rossa Prototype which sold at an auction in California in 2011 for $16.4 million. Only 39 250 GTO’s were built from 1962–1964 by Ferrari. 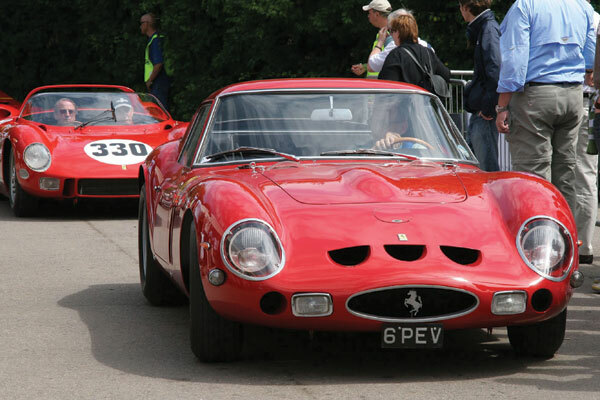 Sports Car International placed the 250 GTO eighth on a list of Top Sports Cars of the 1960s, and nominated it the top sports car of all time. Motor Trend Classic placed it first on a list of the “Greatest Ferraris of all time”. The annual auction was held at Carmel, Quail Lodge & Golf Club. The auction boasts many world-record breaking sales of high-profile vehicles during this event, and amassed a total of $108 Million. Other automakers included Maserati, Alfa Romeo, Mini, Jaguar, Mercedes, and Rolls Royce. Jo Schlesser, the car’s original owner, raced the 3851GT in the Tour de France Automobile. On October 7, 1962 at Montlhéry Autodrome in the Coupes du Salon race, Jo Schlessers friend and co-driver, Henri Oreiller, fell victim to a fatal crash. The owner sent it back to the factory for as-new repair, and sold it to Paolo Colombo on April 7, 1963. While he won awards with the 3851GT in national championship hill-climb contests, Paolo sold it to his friend, Ernesto Prinoth in 1964, who also raced the 3851GT. During one of the races, on September 6, 1964, the Ferrari was crashed again, but the damage was cosmetic and it was restored and race-worthy within weeks. In 1965, Ernesto sold the 3851GT to enthusiast Fabrizio Violati, who kept it in his Ferrari collection until his death in January 22, 2010, at the age of 74. All of the 3851GT’s owners raced and placed in may competitive events. After it was past its prime, the vehicle was kept and maintained in showroom condition within the Collezione Maranello Rosso, dubbed by Enzo Ferrari himself, as a world-class collection, known and highly regarded among Ferrari fans.